Volunteer Coordinator at CMHou & Creative Director at Katsola. 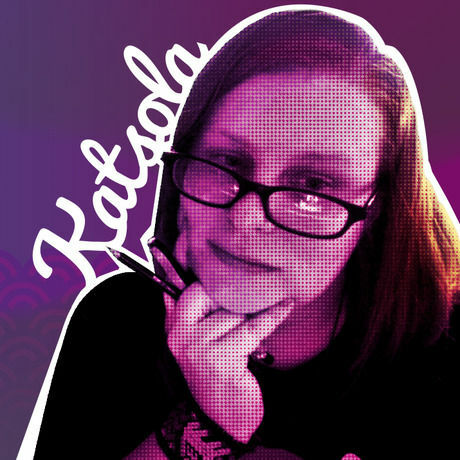 I'm katsola, I create kawaii, naughty creatures, tough girls, murals, illustration, art & design. I get paid to make mischief! Watercolor, Vector Illustration, What makes something Kawaii and Yami Kawaii! Being less shy, being bolder and having more self-confidence. Lauren Hom, Jessica Hische, Junko Mizuno, Paula Scher, Fafi, Miss Van, N.E.W.S. and Hera (Jasmin Siddiqui) from Herakut! As a female artist and illustrator I have always admired the work of other female artists and illustrators. I appreciate their perseverance and vision. Making wee little hearts look sweet and not overdone on even the naughtiest and mischievous creatures. Faces of people; but not names of people. How to draw a Birdie Bat. Collaborations take us into areas we would never go on our own. They teach us a lot about ourselves and other people. Jennifer Blanco Stop, Collaborate, and Listen! Every day when you get up and you wake up in the world and you leave your house, or even not leave your house, you're engaging in a color conversation with the world. You can’t have a benign impact on the world with color, it’s an impossibility. Your choices have to do with how you're communicating. I dress in color stories every day. It absolutely affects what I do all the time. That’s the beauty of being in America: the diversity, that you can pretty much create your own story but still keep who you are and where you came from. Get out there, it's really important. When I own my awesomeness, I can tolerate my messiness. Leslie Scates Personal Reflections on "Humility"